Sat Siri Singh (Frédéric Pommeret) is a certified Kundalini Yoga teacher and has been teaching in New York City since 2004 at various centers such as Golden Bridge, East West Yoga, Kundalini Yoga East, Pure Yoga and Universal Force Healing Center. He has also volunteered at Bellevue’s men’s shelter teaching yoga to men with mental illness and/or drug and alcohol abuse. Born in Versailles, France, Sat Siri moved to New York City in 1992. His spiritual journey has led him to study various forms of meditation, yoga and healing. 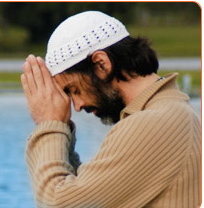 He is certified in the practice of Reiki and Sat Nam Rasayan: a form of spiritual healing through contemplation. Sat Siri is also currently completing a certification as a yoga therapist. He graduated from New York University with an MA in music therapy and is a practicing music therapist. He is currently working in an acute inpatient psychiatric unit with adults who suffer from a mental illness. One of his projects is to find ways to bring yoga and meditation to this underserved population.